How can I access my Online Pics and Videos? Click one of these icons on the shop pages to select the convenient cover style for you. PAL is widely used outside of North America and Japan, that is, in most parts of Europe, Asia, Australia and New Zealand. NTSC is used in the United States and a variety of other countries such as Canada, Japan, and most of South America. If you feel uncertain contact us for further advice. Click the Checkout with PayPal button on our shopping cart page to get to the PayPal Website. Log in if you already have a PayPal Account or submit your data and click Agree and Continue. 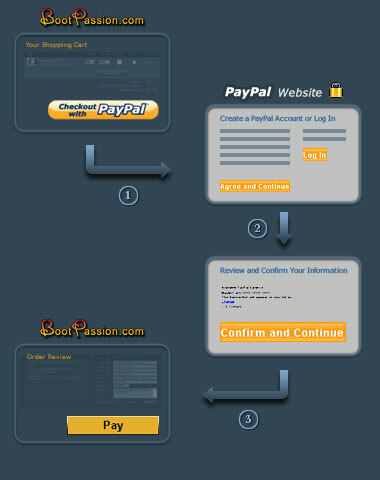 Review the information you have submitted to PayPal. Then click Confirm and Continue which will take you back to us. Review your Order and your Email- and Shipping address (you can even change it here). Then press the Pay button at the bottom of the page. Your payment will not be processed until you press the Pay button! The transaction will appear on your bill als . As soon as we get the confirmation of your payment from PayPal (usually within seconds) we send you a receipt for your purchase. When your DVDs are shipped, you will be sent an extra e-mail acknowledgment to confirm that we have sent off your shipment. 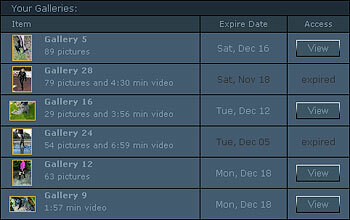 All videos in the online galleries are in wmv format (320 x 240 pixel). For a first impression see the sample video in Gallery 53. Download size is about 3 Mbyte per minute playtime. For easier downloads with slow connections all videos are split into two parts of about 6-9 Mbyte each. 6. How can I access my Online Pics and Videos? After your Payment you'll get a confirmation message with your User Name and Password. Insert the two lines into the Login Box on the Shop page (the password is not valid for the members area)! You have 10 days for downloading. The expire date is announced on the table, so there is no need to hasten.